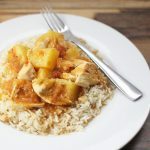 This Instant Pot Mango Chicken is easy, delicious and loaded with fruit! Using the “Saute” setting, then lightly brown the chicken on all sides (3-4 minutes). This step is optional, but it does look more appetizing when browned. Layer all ingredients in the pot, cook on high pressure for 12 minutes. Quick release, then cut the chicken into chunks or slices and serve over rice. If you want your meal to have a little more kick, I recommend a medium or spicy salsa. My kids prefer milder foods.